If you work across different systems which are not in a network you would find it difficult to work as the files that you work on day to day are missing, and there’s easy way by default to check if each and every file if on your working system is available in other system’s. USB Drive’s make it easy to carry along all the required files, but it’s also important to keep it synchronized with your working system so that you always have the same file(s) on your working system and your USB drives if the files have been edited. Automatic – This uses a database of the changes in the files and sync’s both the source and destination folders. Mirror Backup – This makes a new directory with exact copies of the files in the left side or as the source folder. Copy – This method only copies the new and updates files to the destination folder. 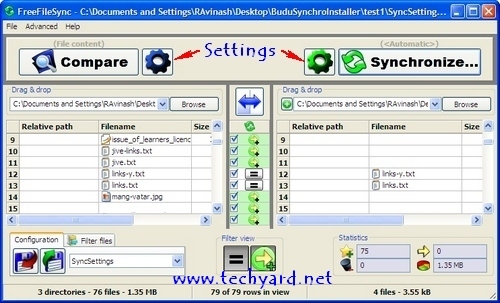 Custom Sync rules can also be created for synchronizing files and folders.Folders also be monitored for real-time updates using the automatic backup. FreeFileSync can also be installed as a portable app, which is optional and can be selected during the installation process, which can be installed on your USB Drive so that it easier to always compare and sync folders on your portable storage drives. On comparing two folders, the equal symbols show the similar files and the comparison can also be done based on file size and date or on file content. How do you keep your files synced ?? Do share any other such tools you know. Where is the undo button to undo an operation? I selected mirror and all folder and files were deleted. Recovery bin didn’t include all files and folders that were lost.